Transport bosses have been told to remove a poster for a new travel card amid claims it was misleading. Transport for London (TfL) advertised its new Oystercard with the line "Blue is the new pink", a reference to the old paper one-day travel card. 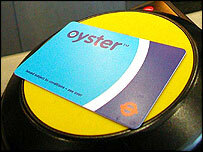 But passengers complained the two were not equal, as Oystercards cannot be used on all National Rail routes. M&C Saatchi, who created the ad, said it made no claims on behalf of any transport network not run by TfL. The Oystercard has been much trumpeted by mayor of London Ken Livingstone, who wants to see less cash being used on buses and the Tube, in an effort to speed up the network. He has reduced Oyster fares for next year while increasing cash fares to encourage more people to make the switch. But while people buying an old one-day pink travel card could use it on the buses, Tube and overland rail, many train companies refuse to accept the equivalent pay-as-you-go on Oyster. The Advertising Standards Authority (ASA) ordered TfL to withdraw the poster, which carried the tagline: "Faster, smarter, easier, Oyster", because it breached the advertising code. A second advertisement claiming using Oyster pre-pay was "more convenient" also drew criticism. The ASA pointed out that passengers would have to buy an extra ticket to travel on National Rail routes not covered by Oyster. A TfL spokesman said: "The main issues raised in the complaints were related to the National Rail network not accepting Oyster, which is beyond our control. "We believe our marketing made clear that Oyster is easier and more convenient than paper tickets for passengers travelling on the Transport for London network." People with weekly or monthly Oystercards can use them to travel on overland rail. Are smartcards as smart as we think?